Pascasie Musabyemungu, Catholic Relief Services' country representative for Rwanda, speaks to a group March 11 at the Archdiocesan Pastoral Center in Philadelphia. The suffering of the people of Africa seems never ending. The starvation of east African children a generation ago has become the starvation of their children’s children today. The civil wars of central Africa in the 1990s have become the terrorist atrocities of today. Through all of it, perhaps no suffering has horrified the world more than the 1994 Rwandan genocide. Since then survivors like Immaculee Ilibagiza have spoken about the murderous violence of one tribe against another in which some 850,000 people perished under the machete’s blade. But along with survivors’ stories comes an irrepressible joy, a brightness of the face that balances hope for a better day with bitter memories and stark realities. That was the message of another Rwandan holocaust survivor, Pascasie Musabyemungu, a woman who traveled from that far-off land to Philadelphia March 11 to tell of her work as the country representative in Rwanda for Catholic Relief Services. 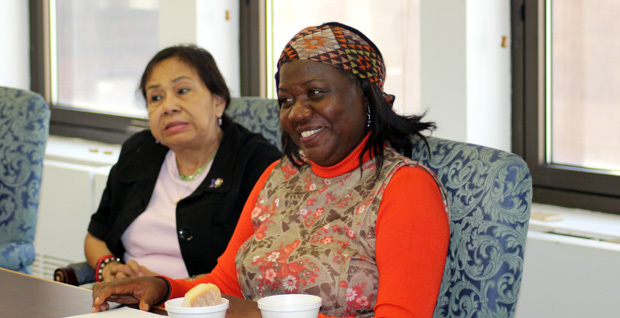 In a lunchtime program at the Archdiocesan Pastoral Center she spoke of the realities of her Maryland-size homeland – literally in her native language, “the land of a thousand hills.” But it is also “the land of a thousand challenges, and the land of a thousand solutions and a million smiles,” she said. Musabyemungu has worked with CRS for 15 years in support of the U.S. Catholic bishops’ agency for overseas development and relief. In addition to educating young mothers how to provide their children a nutritionally balanced diet from locally produced food, CRS helps villagers expand their traditional subsistence farming to produce more food from small plots. The surplus produce, along with hand-crafted vessels, is sold at market to provide families extra currency. Musabyemungu explained a CRS initiative in which groups of 15 to 25 people form a tiny community bank. The members are asked to deposit a small amount of money, record the deposits and at the end of the year account for the funds. The pooled savings are then available to loan among the members at a low interest rate to help resolve a person’s need, who later repays the loan for another’s use. More than 1.4 million Africans gain access to capital through the CRS microfinance program that they otherwise would not have, according to the CRS website. She described a slow process of lifting the standard of living where 44 percent of the population lives in poverty, and an equally arduous process of reconciliation of people after the genocide. Musabyemungu placed blame for the violence that saw some people of the Hutu tribe seek out and murder rivals of the Tutsi tribe, and moderate Hutus, squarely on the politicians of the time. They used mass media to exploit social divisions, stir up group fear through rumors and misconceptions, and to divide people, and she said. After the killings and a mass exodus of survivors from the country, its physical infrastructure was destroyed. But its civic infrastructure was also overwhelmed. A peace commission similar to one that emerged after apartheid was swept away in South Africa was set up by the Rwandan government, with the local Catholic Church and CRS as a partner. In what she recalled as a “hard process,” a panel of “wise people” met to hear individuals from both sides of the conflict. Some perpetrators repented and asked forgiveness, and some victims found they were able to forgive those they watched kill family and friends, or steal from the homes of their murdered neighbors. “They were able to forgive after they heard the truth,” Musabyemungu said. As a result, some of the people who showed remorse, as well the planners of the genocide, received shorter prison sentences of three to 10 years. She pointed to one shining example of CRS’ peacemaking efforts underway in Rwanda, as well as cooperation alongside budding commerce. Recently three Rwandan women from different tribes working in their own small businesses accompanied one another across the border for an opportunity in Democratic Republic of Congo. At bedtime together, one woman lay awake all night frightened of the women from the rival tribe. In the morning one of the other women asked her to care for her baby while she bathed. Surprised at the trust shown her, the woman was no longer afraid, and allowed herself to form lasting friendships with her companions. The work of the peace commission in Rwanda and its partners like CRS has brought together “those who had been enemies so they can live together as one human family,” Musabyemungu said.